U.S. Customs and Border Protection (CBP) is trying to facilitate trade while dealing with an unprecedented migration crisis. The volumes and demographics of migrants are unlike anything seen before. Border patrol resources are beyond capacity. The last time it was like this was in 2008. Large groups of migrants are crossing the border, sometimes in groups greater than 100 people at a time, which makes processing more difficult and resources limited. Moreover, an increased number of sick children that need urgent medical attention are crossing, as well. The CBP officer on the conference call stated that the entire immigration system is in a major meltdown. There is not enough capacity to hold people. CBP releases people with no criminal history into the local communities and into faith-based organizations. A typical day in the past was 1000 – 1500 people per day. This past week they saw approximately between 3000 – 4200 migrants per day. U.S. Customs and Border Protection is being allocated to assist Border Patrol. CBP is redeploying staff from many ports of entry, with 545 officers redeployed thus far. They will redeploy up to 750 officers, who will be deployed for 30 days. There is currently no plan to redeploy officers from the northern border, but if this continues throughout the summer, all CBP workforce could be impacted by deployment. The rail has not been impacted at this time, which already operates with a minimal staff. Laredo had 300 officers pulled – a 12% cut into their normal workforce. El Paso had 194 officers pulled – a 15% cut into their normal workforce. Arizona – has had no officers pulled, but they are not receiving the officers they usually get from elsewhere, so they are feeling the impact, as well, which is an a 8% cut into their normal workforce. After they reach 750 officers redeployed, they will start pulling CBP officers from major airports. This will cause a slowdown in U.S. Customs in airports across the country. By the way, there is no special consideration or options for tourists. The CBP officer stated that passenger and cargo wait times are significantly increasing across all of the southern border. Cargo at El Paso has an approximate wait time of 7 hours vs. 1 hour just one year ago. Other ports are in a similar situation with a 3-4 hour wait time vs. 1 hour or less wait time just one year ago. CBP is trying to give priority to C-TPAT and FAST organizations, but has no control over the queuing on the Mexico side of the border. Scarbrough also has a direct link to the border wait times on our homepage. The U.S. ocean ports have not yet been affected by this, but one can forecast high airline rates because of increasing demand. 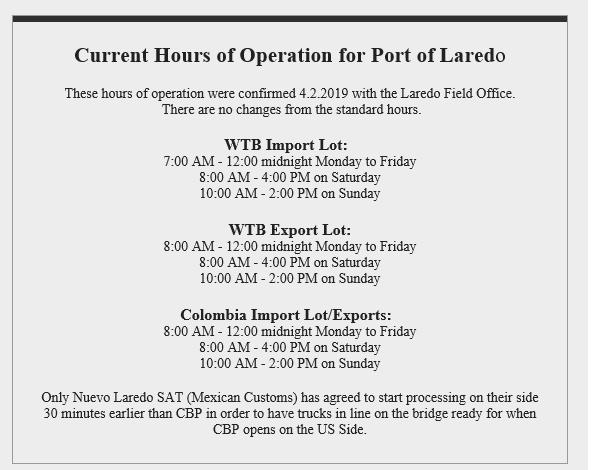 Furthermore, the CBP officer on the conference call mentioned that trucks are waiting overnight in a queue to be processed first thing in the morning, which means CBP is starting each day extremely behind because of the back up from the day before. It was noted that CBP will not displace the officers working on narcotics and drug trafficking issues. Holy Week has typically seen a historic spike in crossings, which is expected to increase again this year bringing further impact and delays. This means that cargo exams will also take longer due to staff shortages. Some ports are closing weekend cargo processing in order to deploy staff to weekday cargo processing. All cargo processing is being impacted and choosing an alternate port may have a little benefit. Feel free to reach out to our Southern Border Operation Manager for other options at scamarillo@scarbrough-intl.com. The officer reiterated the entire system is in a meltdown and the cargo and port of entries are part of it. There is an “unacceptable” number of people in custody, which has reached 13,000. The CBP officer on the conference call also mentioned that other Department of Homeland Security workforce areas were being considered for deployment such as the U.S. Coastguard and FEMA, if they have the necessary skill set including law enforcement training, etc. Right now, CBP is the only area being redeployed. Field managers on the ground at each port of entry are making the decisions on changes in hours of operations to accommodate the waiting trucks. Notices will be sent out through their regular channels of communication. CBP is working to set up weekly or bi-weekly calls.